The Darkness have unveiled the first photo of their new lineup, featuring the recent addition of drummer Rufus Taylor, son of Queen legend Roger Taylor. Taylor joins the band following the recent departure of drummer Emily Dolan Davies, just a month after she made her live debut with the group; she stepped in to record the group’s forthcoming album, “Last Of Our Kind”, after a split with original sticksman Ed Graham last fall. With just a few weeks away from the June 1 release of their fourth album, The Darkness have announced the Blast Of Our Kind UK tour. The 3-week, 14-date fall run starts November 30 in Norwich and will wrap up at London's Roundhouse on December 20. A fan club presale starts May 13 and a Live Nation presale begins May 14, with general public tickets going on sale on May 15 at 9 am. 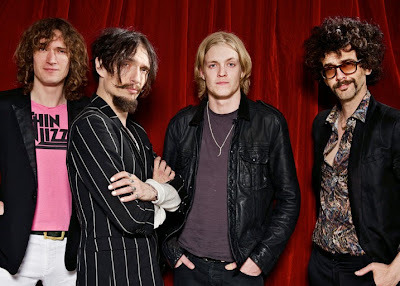 The Darkness will launch “The Last Of Our Kind” with a showcase concert at Dingwalls in London on June 3, followed by a series of UK festival appearances this summer.